The ibis Pau Centre hotel is located opposite the main post office. Only 20 minutes from the airport, it is close to several restaurants. It has 61 air-conditioned rooms, including 3 equipped to accommodate disabled people, a bar serving snacks and quick bites 24 hours a day and a private, covered car park. Business guests can make use of free WIFI access. Golf course 3.1 miles (5 km) away, tennis courts 4.3 miles (7 km) away. of the Pyrenees where the city funicular lends a timelessness to this exceptional scenery. With its national stud farm, motor racing track and white water stadium, the city stays true to its history while developing its heritage. Good, comfy bed and nice breakfast. The stay was good, but finding the hotel was incredibly difficult. Pau has so many no access roads and our sat nav couldn’t cope. It took nearly an hour from arriving in Pau until we managed to navigate the maze of streets and check in. The nearest parking is a good 10 minute hike and down steep steps, it wouldn’t work for anyone with small children or limited mobility. Finally, the towels, thin, small and mean. So although the bed was comfortable, it was quiet and there was a good choice at breakfast we won’t be coming back. We were not aware that smoking was permitted in hotels in the EU. We were on the first floor which we later found out was the &quot;smoking level&quot;. We had to run the gauntlet of the long corridor from our room to the elevator in the stinking atmosphere of tobacco smoke. When you request a non-smoking room you should not be accomodated with the smokers. We had a double-room with a dog. Although the bed was of a reasonable size and comfortable. The room was tiny and impossible to move around in. No refrigerator in the room. No kettle or other coffee/tea preparation system. The hair dryer was out of order. Reception kindly gave us a handheld hair dryer but the only working electrical socket is not near a mirror. The coffee machine in the breakfast room was at first out of order and afterwards distributed coffee which was barely drinkable. The service at the hotel was excellent. The hotel itself needs work. Nice stay great breakfast Elody at the Front desk made a fantastic job! Ok, the rooms are really small but an excellent bed, pillows ,duvet in what was a very quiet room more than made up for it. I stayed in the city center IBIS for two nights and found the hotel to be clean and comfortable, unfortunately due to the weather I was not able to fully make the most of the location. My only critisism would be the lack of parking which was not understood untill I arrived, this trip was booked by our corporate team and they were unaware that parking had to be booked so better advertisement of this would be a bonus. I stayed in the hotel for 2 nights for a work trip. Very good location. Useful underground parking. Rooms a bit small. Very pleasant and useful staff. A quick overnight and mostly pleasant. We enjoyed parking behind the hotel and picking up a salad at the pizza place just doors away. The first room we were given smelled of smoke and we were quickly given a new room when we requested it. One thing I would ask: please remove the constantly-on green night light in the room. Its blue component is detrimental to sleep. Very nice breakfast including a water bath for boiling eggs as you like them. 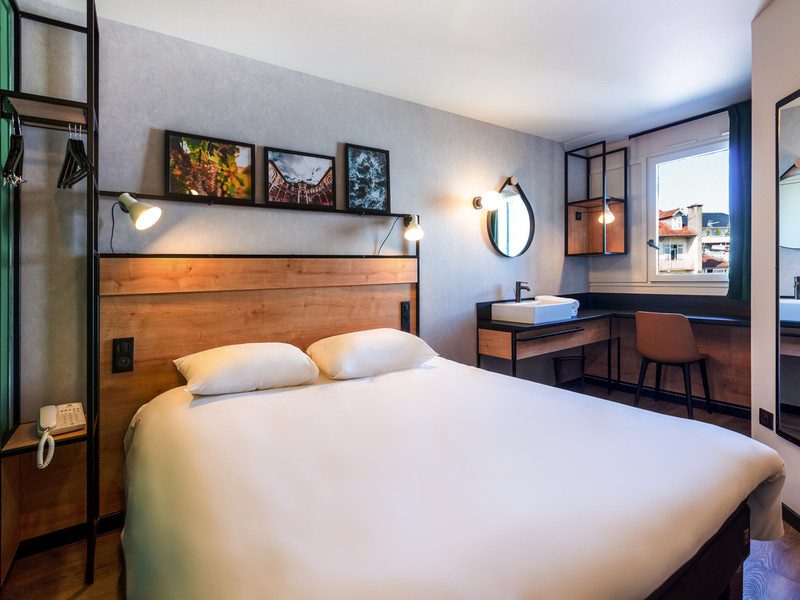 Comfortable hotel close to the centre of Pau. Efficient friendly staff. It's the best hotel in the centre, however, from a room size stand point, not very wide at all. On top the A/C is doing a lot of noise, even in slow fan speed. Well, It used to be a good hotel back in the 80s. Everything was perfect from the checking to the check out with a great breakfast and the room that we can expect when you go to a Hotel Ibis. Great value for money. Very good service from the friendly Indonesian girl who was looking after the b/fast and the reception at the same time. But also great service from the guy who check us in and the girl who was looking after the reception at night. Both of them were very helpful. Good welcome. First day’s parking free in nearby underground car park. Ticket was offered without having to ask. Comfortable room. Good central location. Breakfast excellent. A bit difficult to find but a warm welcome ensured. Very clean and comfortable - right in the centre of town.